Definition: A popular form of alternative dispute resolution, which is supposed to be faster, cheaper and less formal than the traditional court process. The disputing parties’ case is heard privately by an impartial, independent third-party, called an arbitrator, according to the terms of the arbitration agreement. After hearing evidence the arbitrator makes an arbitration award which is a decision. This decision is final and binding on parties, which means they must follow it and there is normally no right to appeal. 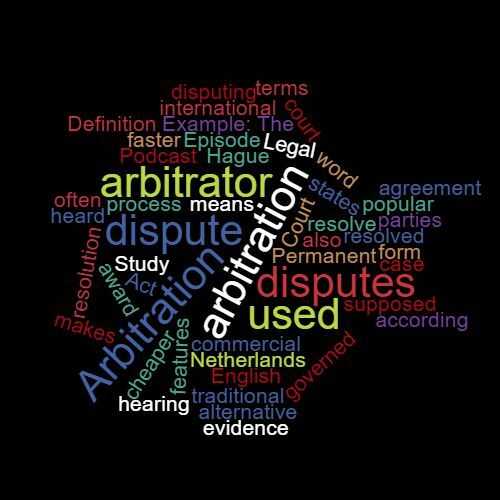 Arbitration is often used in international commercial disputes but is also used as a means to resolve disputes between states, through the Permanent Court of Arbitration in the Hague, Netherlands. In the UK arbitration is governed by The Arbitration Act 1996. Example: The dispute was resolved through arbitration. This word features in Episode 58 of the Study Legal English Podcast.